These new "Dolly Pocket" dolls from the North American Bear company feature mini dolls and tiny stuffed finger puppets riding along in their pockets. So cute! Little Red Riding Hood is a Dolly Pocket that comes with a tiny hunter, grandmother, and wolf in her pockets. She's also available on eBay. 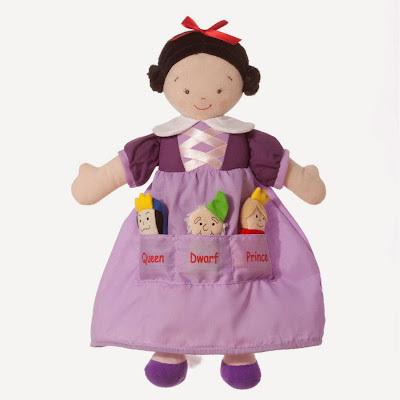 The Snow White Dolly Pockets comes with Queen, Prince, and Dwarf finger puppets. She's also sold on eBay. The Dolly Pockets Wizard of Oz Dorothy doll comes with finger puppets depicting the Cowardly Lion, Tin Woodman, and Scarecrow. 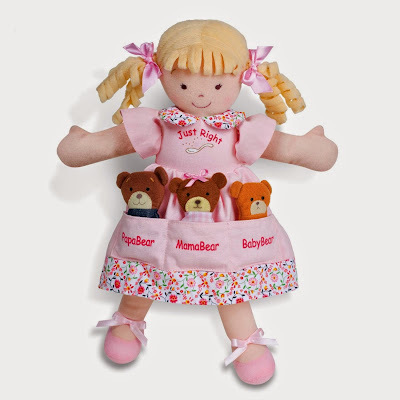 As one would expect, the Dolly Pockets Goldilocks comes with Mama Bear, Papa Bear, and Baby Bear. She's also sold on eBay. The Dolly Pockets Cinderella wears a pink and purple dress. In her pockets she carries a pumpkin, Godmother and Prince. She's also available on Amazon. 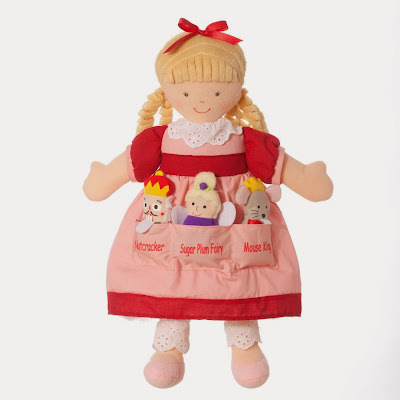 The Clara Dolly Pockets doll depicts the little girl from The Nutcracker. In her pockets she carries a nutcracker finger puppet, plus a sugarplum fairy and a mouse king. She's also available on eBay.